Disclaimer: This blog post was sponsored by Mattel Canada. The opinions are completely my own based on my experience. I’ve started playing a boardgame called Blokus and I’m addicted!! Blokus is strategic game which involves 2-4 players. It’s a great game to play for couples but also at social events with friends and family. What’s really cool about Blokus is there is only ONE rule, but it’s more complex than one would think. In the game, the way to win is to cover the most squares on the board – seems simple right? There is a lot to consider with every move: positionally and tactically. The game ends when no players can place anymore pieces on the board. Depending on the number of players — will influence how the game is played and the strategy behind it. Earlier this year, when I was teaching chess to kids during spring camp we would have time to play other board games and Blokus was a favourite! I lost a few times against the kids in the beginning but I feel like I have always been a fast learner so eventually wasn’t finishing in last place! The kids at the camp loved the game because they knew they can put what they’ve learned from chess PLUS the game pieces look really cool. The game itself isn’t very big nor heavy to bring around to parties and other events, very easily was I able to put it into my backpack and take it to my events. I’ve recently been playing Blokus with boyfriend and my friends on our terrace or people from my chess club at a board game cafe. I still have a lot to learn about Blokus, but everything requires practice; the more I play the better I will become. I definitely know there are certain pieces in Blokus that should not be played first, like the ones that consist of 1-3 blocks. I have tried this strategy and it has lead me to lose the game quickly! Instead I use a 4+ block piece that will be able to look closest to the center. The small pieces (that consist of 1-3) should be placed at the end, when you are close to running out of moves. As I mentioned before, depending how many people play the game, different strategies can be used. I’ve played the two-player, three-player and four-player version – all super fun!!!! Q: There are many strategy games out there – but how can people of all ages benefit from them? A: I would definitely agree that playing chess at a professional level has helped me in every aspect of my life and personality. People develop problem-solving skills, enhance creativity, and have been shown to improve skills in reading, mathematics and other academic subjects. I think strategy games (including chess and Blokus) can improve one’s ability to concentrate. If you move too quickly and without thinking there will most likely be bad consequences – just like in real life: if you don’t think of your words or actions you can hurt someone or yourself. Chess has helped me to think for long periods of time, since the game is complicated and every position has thousands of possibilities. Strategic games have also helped my short and long-term thinking – it’s important to be very sharp in calculation (up to 7 moves ahead) but also try to see and imagine what the end of the game could look or be like. In life, everyone has short or long-term goals they’d like to achieve – but people must think about both consistently if they’d like to succeed. Creativity is another factor that is linked with strategy games. Instead of beating your opponents in a boring way – beautiful sacrifices can be done to make it more interesting or to even challenge yourself. I definitely love games that can be interesting and dangerous for my opponent or myself – instead of just winning in 10 moves or less. For my experience, strategy games improve skills in reading, math and other academic courses/subjects because they use similar parts of the brain. If I was to recommend what age to start playing any strategic games it’d be around five or six years old. All skills being taught can be used to help with school studies. If the child is too young to play (especially since everyone is different) – I would suggest to take a break and re-introduce the games a little bit later. Which is actually what happened with me and chess. At age four it was too complicated for me to play so I lost interest but four years later I saw my dad playing again and took it up again! Chess, Blokus and any other board games can also be played until very old age! Strategy games can be played forever and will never go out of style! Strategy games can have a really positive impact on an individual! The more games you play, the smarter that person will become. What do other chess players/people say about Blokus? Hello everyone, I would like to thank all of my fans who keep up to date with my chess & life adventures the past few years. Here are my stats as of today. You guys are awesome, wouldn’t be here without you! Over the weekend I went on this gorgeous hike called Snow Lake. To those of you who do not know, I am on a very long vacation out in the west coast. Currently staying around Seattle. It’s very beautiful here – there are many hikes to choose from. A few weeks ago, I got to visit Victoria, British Columbia. The last time I was there – 2005 for the Canadian Youth Chess Championship where I placed 1st. I am hoping to see Vancouver very soon because it’s less than 3 hour drive from me! If any of you have any suggestions on what I can see in the Washington/British Columbia area, comment below or send me a private message: yelizavetaorlovachess@gmail.com. Walking around Bellevue, Washington! These pics were taken & edited by me. How has chess helped you in real life? – Answered by Chess Players all around the World! Chess is a beautiful old game which requires a lot of calculation, theory, and strategy.. Whether we are looking at short or long calculations, it improves our mind in different ways to help us in our everyday lives. Thinking before you moves goes with thinking before making certain actions. Tactics goes hand in hand with creating short term plans/goals, while Strategy goes with long term plans/goals. Openings helps you improve your memorization skills which could help a lot in school. Hi everyone, My name is Yelizaveta Orlova – I am a WCM and WNM. I used to play competitively but now I’ve taken up teaching mostly. My friend and I love chess so we have started our own business in Toronto, Canada! If you know anyone who lives here – please let them know about us! Learn and play chess in a social atmosphere. 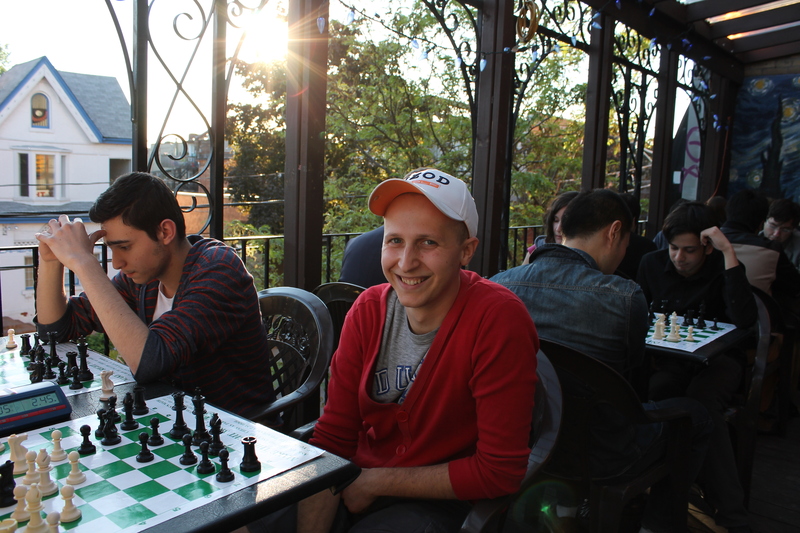 Pub Chess Toronto’s founders are top players in the country. We hold teaching sessions/lectures + casual/competitive play. Currently, we are re-located at “The Madison”, which is in the heart of Annex and 2 mins walk from Spadina station. Our past location was “The Central”, Markham & Bloor. The point of our meet up is to popularize chess. 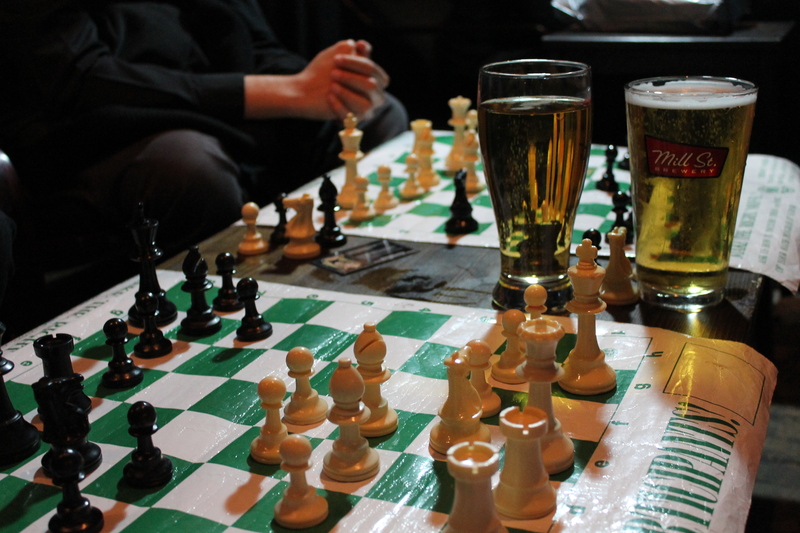 Chess is known to be a very sophisticated game but we want to show the social and fun aspect of it! Come out, drink/eat, meet new people over the chess board! Every wednesday there will be a lecture/blitz tournament/casual play.